Three weeks before she died in a Paris car crash, Diana, Princess of Wales was making headlines in Bosnia. 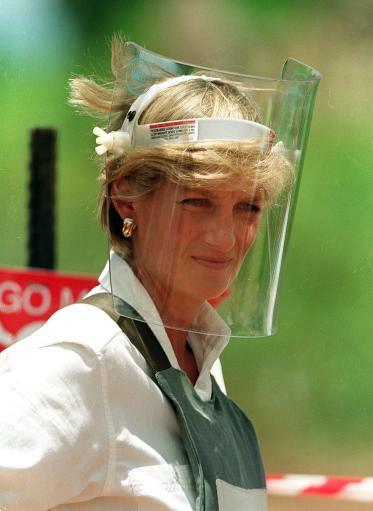 Her 1997 visit to the country was the last in her world tour to raise awareness about the persistent dangers of anti-personnel landmines. Earlier that year, she had visited Angola to meet with several generations of landmine victims--and was criticized publicly by members of the British government as a "loose cannon" for her outspoken insistence that nations sign on to an international treaty banning landmines. Outspoken was not the word for Diana as she began her career in the public eye. Early on she was dubbed "Shy Di" for her way of shrinking from photographers and podiums. She admitted that she giggled too much when she became nervous during a speech. But she was also aware that public speaking must become one of her strengths. Her speaking coaches included the actor Sir Richard Attenborough, Peter Settelen (who later become infamous for his candid recordings of Diana), and communications strategist Richard Greene. They encouraged Diana to overcome her fears of public speaking by allowing herself to speak more conversationally and more passionately. One of her greatest strengths as a public figure was her sense of warmth, which conveyed beautifully in photos and video when she was filmed hugging a person with HIV or playing games with children in homeless shelters. Speaking would feel more comfortable, Greene told her, if she drew from the sense of compassion that seemed to come so easily to her. She acknowledged what was in front of her audience--herself: Early in her speech, she addresses the controversy surrounding her Angola visit, defusing the question and defining her role in the cause: "Some people chose to interpret my visit as a political statement. But it was not. I am not a political figure. As I said at the time, and I'd like to reiterate now, my interests are humanitarian. That is why I felt drawn to this human tragedy." She dressed for the occasion: Her choice of business-like black and white for the speech--severe and plain by the standards of the wardrobe of the world's most photographed woman--kept the focus on her words. She wore a similarly unadorned suit for another famous speech on the treatment of AIDS patients in 1993. The problem belongs to all of us: Diana used several strategies throughout the speech to encourage the idea that landmines are a problem for all countries to solve. "We," "ours" and "us" appear frequently, and her rhetorical questions are some of the most passionate lines of the speech: "How can countries which manufacture and trade in these weapons square their conscience with such human devastation?" Use the Evernote clip button, above, to save this post in an Evernote notebook or start an Evernote account. (If it doesn't work for you, try using a 'modern' browser, like Chrome or Firefox.) Go here to subscribe to Step Up Your Speaking, my free email newsletter that looks at a different speaking topic in depth each month...then become a fan of The Eloquent Woman on Facebook and join the conversation with thousands of other women (and men) about public speaking skills and confidence.